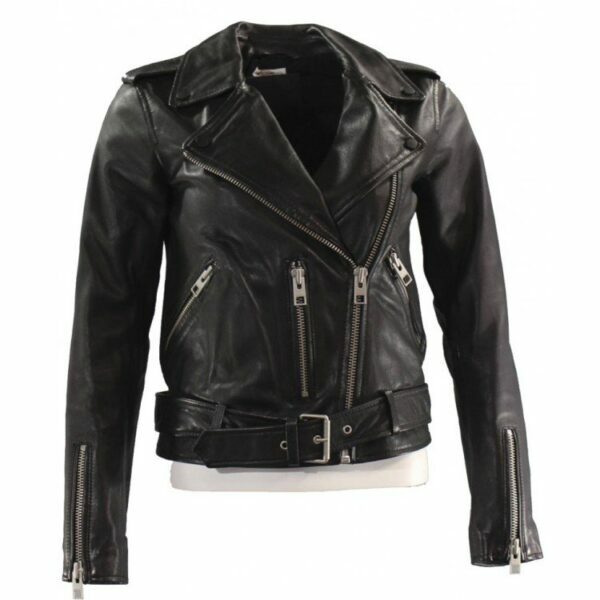 It is the best moment for all of the Camilla Morrone lovers because leather jacket black has introduced the jacket by the name of Death wish in which Camilla Morrone had shown his feet. Death wishes Camilla Morrone is the coat which is made of faux leather stuff and it has an inner viscous lining which can make it precious and decent. It is available in black color which is very demanding. This jacket has full sleeves with the zipper cuffs which give them a beautiful look. The sleeves of the jacket are in fitting. The front of Death wishes Camilla Morrone jacket is asymmetrical zipper closure and its shoulder is epaulets. Its collar is also made of leather and at the corner of the collar there are button and collar is lapel. There is a buckle belt at hemline which gives it a modern look. It is specially made for bike riders. This jacket has two side waist zipper pockets in which one vertical pocket is present at the front and the other is present at the front side of the jacket. Overall this jacket looks very decent and gives us a very modern look and we can easily wear it any casual event. Love this jacket! It is really really cute and is the perfect color to go with any outfit in the fall. The lining is really soft. zipper style is so beautiful which attracts me. I freaking LOVE this jacket! It was my first jacket I bought off a leather jacket black so I was skeptical. I wanted a nice leather looking casual jacket but didn’t want to pay hundreds of dollars. This jacket is AWESOME. It’s durable, thick, and WARM. This looks good and will keep you warmed up even in chilly temps. The perfect fall jacket.